Made Out of WHAT has curated a selection of work from around the globe made out of consumer and industrial waste: proof positive that old street signs, plastic bottles, used wine corks, and even street garbage can be transformed into beauty and utility. An amusing temporary art installation of recycled plastic bags by renowned international artist Claudia Borgna animates Helms Way, offering a witty commentary on our mainstream consumer culture. Express your creativity and playfulness and help Made Out of WHAT complete a work of art made out of plastic bags! We invite all ages to embrace a new way of considering trash: not simply as a dangerous blight but as a raw material with a multitude of applications. 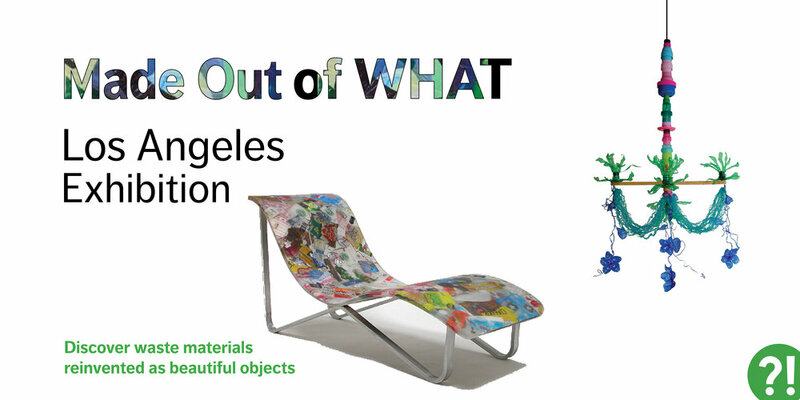 We are excited to announce Made Out of WHAT's invitation to exhibit at Dwell on Design at the Los Angeles Convention Center April 5th to 7th! Founder and Creative Director, Denise Domergue, curated the first solo gallery show in LA of the work by the nationally acclaimed artist Karyl Sisson. With mystifying twists and mathematical logic, Sisson meticulously crafts her art, furniture and jewelry out of a variety of overlooked domestic items. The New York Times recommends MOoW as a "Don’t Miss Destination"
Even the The New York Times is getting with the program of adaptive re-use. A listing in their April 27th edition encourages readers to visit Made Out of WHAT’s pavilion in Times Square during Design Pavilion, and we couldn’t be happier. (VENICE, CA) In an unconventional twist, a California-based non-profit is taking the opposite tactic of depositing its trash into New York City’s Times Square. Made Out of WHAT, an organization dedicated to transforming society’s perception of post-industrial waste, showcases artists who use discarded materials to make beautiful objects. A portable exhibition built entirely of recycled materials will be assembled on a triangular island at 7th Avenue and 43rd Street between May 18-22, 2017 as part of Design Pavilion NYC, an annual outdoor event. Inside the hexagonal pavilion a display of the artist works made from upcycled materials can be seen. “Of course we’ll take it away when we’re done,” says Denise Domergue, Made Out of WHAT’s founder and guiding light. “But while it’s there people can get a look at some of the truly inspired things people are doing with transformed trash.” The organization hopes to spread the message that adaptive re-use is the wave of the future, a creative alternative to the problem of toxic landfills and widespread environmental pollution.